Diabetes mellitus type 2 is a "subclass of diabetes mellitus that is characterized initially by insulin resistance and hyperinsulinemia; and eventually by glucose intolerance; hyperglycemia; and overt diabetes. Type II diabetes mellitus is no longer considered a disease exclusively found in adults. Patients seldom develop ketosis but often exhibit obesity." Impaired glucose metabolism refers to impaired fasting glucose and impaired glucose tolerance. Clinical practice guidelines address the care of patients with diabetes mellitus type 2. Diabetes mellitus type 2 is characterized by insulin resistance, high insulin levels, and declining function of insulin-secreting cells of the pancreatic islets (beta-cells). Diabetes mellitus type 2 is associated with the Metabolic syndrome X (Abdominal obesity-metabolic syndrome). Diabetes mellitus type 2 is genetically heterogeneous and variations are labeled NIDDM2, NIDDM3, NIDDM4. Maturity-onset diabetes of the young (MODY) is "an autosomal dominant form of diabetes typically occurring before 25 years of age and caused by primary insulin secretion defects. Despite its low prevalence, MODY is not a single entity but represents genetic, metabolic, and clinical heterogeneity" Several mutations may cause MODY and these variations are labeled MODY1, MODY2, ... MODY9. Because these mutations may cause diabetes at a later ge and other conditions can cause early diabetes, it has been suggestions to label these mutations "autosomal dominant noninsulin-dependent." HbA1c levels 5.5% may rule out while levels 7.0% may rule in diabetes. Regarding a single cutoff, a glycosylated hemoglobin A value of ≥ 6.5% may be used to diagnose. Fasting glucose level > 5.6 mmol/l (100 mg/dl) and < 6.9 mmol/l (125mg/dl). A cost-benefit analysis suggests that screening should start between age 30 and 45 and be repeated every 3 to 5 years. Appropriate tests are "measuring hemoglobin A1c or fasting plasma glucose or with an oral glucose tolerance test"
Regarding who to screen: "Risk factors include age of 45 years or older, overweight or obesity, or a first-degree relative with diabetes. Women with a history of gestational diabetes or polycystic ovarian syndrome are also at increased risk. Certain racial/ethnic minorities, including African Americans, American Indians/Alaska Natives, Asian Americans, Hispanics/Latinos, and Native Hawaiians/Pacific Islanders, are also at increased risk compared with whites." Regarding confirmation of positive screening: "The diagnosis of IFG, IGT, and type 2 diabetes must be confirmed unless symptoms are present. Repeat testing using the same test on a different day is the preferred method of confirmation. If diagnosis cannot be confirmed by the results of two tests, but at least one test indicates high risk, clinicians may wish to follow the patient closely and retest in 3 to 6 months"
Regarding rescreening: "every 3 years may be a reasonable approach for adults at low risk with normal blood glucose levels. For adults at high risk or those who have near abnormal test values, repeat annual screening may be warranted." "Screen for type 2 diabetes in asymptomatic adults with sustained blood pressure (either treated or untreated) greater than 135/80 mm Hg. (B recommendation)"
"Current evidence is insufficient to assess the balance of benefits and harms of routine screening in asymptomatic adults with blood pressure of 135/80 mm Hg or lower. (I statement)"
Screening obese patients may also be beneficial. In hypertensive patients, identifying diabetes would lower the goal diastolic pressure to ≤ 80 mm Hg. In hypercholesterolemia patients, identifying diabetes would affect decision making due to changes in calculating cardiovascular risk in the ATP3 clinical practice guideline. "The evidence is insufficient to recommend for or against routinely screening asymptomatic adults for type 2 diabetes, impaired glucose tolerance, or impaired fasting glucose" (italics by CZ), this was a grade I recommendation when published in 2003. In 2005, an evidence report by the Agency for Healthcare Research and Quality (AHRQ) concluded that "there is evidence that combined diet and exercise, as well as drug therapy (metformin, acarbose), may be effective at preventing progression to DM in IGT subjects". The American College of Endocrinology announced in 2008 clinical practice guidelines for the treatment of prediabetes. Various testing strategies are available, including [[clinical prediction rule]s]. Glycosylated hemoglobin A values are not perfect. A second clinical prediction rule, QDSCORE®, may "predict the 10-year risk of developing Type 2 diabetes in the UK". • Coronary heart disease or risk factors Valsartan up to 160 mg daily for five years Placebo Diagnosis of diabetes mellitus type 2 "relative reduction of 14% in the incidence of diabetes but did not reduce the rate of cardiovascular events"
• Coronary heart disease or risk factors Nateglinide up to 60 mg three times daily for five years Placebo Diagnosis of diabetes mellitus type 2 "did not reduce the incidence of diabetes or the coprimary composite cardiovascular outcome"
• exercise General information about diet and exercise at given at base line and annually Diagnosis of diabetes mellitus type 2 "Type 2 diabetes can be prevented by changes in the lifestyles of high-risk subjects"
• "Lifestyle intervention in people at high risk for type 2 diabetes resulted in sustained lifestyle changes and a reduction in diabetes incidence, which remained after the individual lifestyle counseling was stopped." • Vascular disease events • "Lifestyle changes and treatment with metformin both reduced the incidence of diabetes in persons at high risk"
• BMI 25 - 40 Acarbose 100 mg of acarbose 3 times a day Placebo Vascular disease events "This study suggests that treating IGT patients with acarbose is associated with a significant reduction in the risk of cardiovascular disease and hypertension"
• "Rosiglitazone at 8 mg daily for 3 years substantially reduces incident type 2 diabetes and increases the likelihood of regression to normoglycaemia"
• Vascular disease events "ramipril for 3 years does not significantly reduce the incidence of diabetes or death but does significantly increase regression to normoglycemia"
2008 4570 patients in 31 randomized controlled trials including Diabetes Prevention Program Research Group Metformin Placebo or no treatment Varioius outcomes Metformin treatment in persons at risk for diabetes improves weight, lipid profiles, and insulin resistance, and reduces new-onset diabetes by 40%. • At least one risk factor for diabetes Voglibose 0.2 mg three times a day orally Placebo Diagnosis of diabetes mellitus type 2 "Voglibose, in addition to lifestyle modification, can reduce the development of type 2 diabetes in high-risk Japanese individuals with impaired glucose tolerance." In selected patients, dieting to loose approximately 3% of body weight can remit mild, assymptomatic diabetes in approximately 50% of patients according to one trial. Intensive insulin treatment with a goal of normoglycaemia can cause diabetes in newly diagnosed patients to remit in one of four patients after one year of follow-up. However, there was no control group that did not receive intensive therapy. Prior uncontrolled cases series have reported similar results. These studies have been summaried by Retnakaran. For most patients the goal of treatment should be a Hb A1c of 7.0%. The benefit of intensive therapy is not certain. Below is a summary of clinical practice guidelines and randomized controlled trials that support this recommendation. The benefit of achieving a Hb A1c of 7.0% is small according to a decision analysis. An Hb A1c of 8.0% - 9.0% may actually be safer according to a cohort study. For most patients, clinical practice guidelines recommend a goal Hb A1c of 7.0%. "The A1C goal for patients in general is an A1C goal of <7%." "The A1C goal for the individual patient is an A1C as close to normal (<6%) as possible without significant hypoglycemia." The current ADA recommendation is from a consensus statement of 7% following the results of the trials below that suggest no benefit from goals below 7%. Clinical practice guidelines by the National Institute for Health and Clinical Excellence recommend starting metformin or a sulfonylurea is Hb A1c is more than 6.5%; however, a thiazolidinedione or insulin should not be added unless the Hb A1c is more than 7.5%. These guidelines have been summarized. In older patients, clinical practice guidelines by the American Geriatrics Society states "for frail older adults, persons with life expectancy of less than 5 years, and others in whom the risks of intensive glycemic control appear to outweigh the benefits, a less stringent target such as 8% is appropriate." A goal fasting blood glucose of below 108 mg/dl (6 mmol/L) over 10 years resulting in an Hb A1c of 7% over 10 years was found in the United Kingdom Prospective Diabetes Study (UKPDS 33) randomized controlled trial. Intensive control reduced diabetic complications in one out of every 20 patients (number needed to treat = 20). A goal fasting blood glucose of below 108 mg/dl (6 mmol/L) over 10 years resulting in an Hb A1c of 7.4% over 10.7 years in the metformin group compared to 8.0% in the conventional group in the UK Prospective Diabetes Study (UKPDS 34) randomized controlled trial. Metformin reduced cardiovascular disease in one out of every 11 patients (number needed to treat = 11). A Hb A1c of 6.9% over 6 years was found in the VA Diabetes Trial (VADT) randomized controlled trial to have no significant effect on diabetic complications. Although the treatment group averaged an Hb A1c of 6.9%, the goal was 6.0%. A Hb A1c goal of 6.5% over 5 years was found in the ADVANCE randomized controlled trial not to reduce mortality using a protocol whose first step was a sulfonylurea (gliclazide). The intervention group had 0.9% less nephropathy, but more severe hypoglycemia. A Hb A1c goal of 6% over 3.5 years was found in the ACCORD randomized controlled trial found to increase serious complications. The ORIGIN trial used basal insulin supplementation to reduce the Hb A1c from 6.4% to 6.2%. There was no benefit on cardiac outcomes but there was an increase in hypoglycemia and weight gain. The PROACTIVE study used pioglitazone. The older University Group Diabetes Program (UGDP) also found no benefit in a controversial randomized controlled trial. The UGDP randomized approximately 1000 patients to one of five treatment groups and followed from 1962 to 1975: phenformin, tolbutamide, small fixed-dose insulin (ISTD) based on body-surface area (averaged 14 units per day), variable-dose insulin (ISTD) (averaged 45 units per day), n (IVAR), or placebo. The trial found statistically significant increase in cardiovascular deaths among the patients treated with tolbutamide and so this group was stopped in 1969. The phenformin group was also stopped early due to increased mortality. The ISTD group had no reduction in blood glucose. The IVAR group had a reduction in the IVAR group of about 2.0 mmol/L (36 mg/dL) which correlates to a 1% difference in the level of Hb A1c. Problems in the trial include: 1) "25% of placebo and tolbutamide-treated subjects dropped out or changed medication during the trial, 2) glucose values were only checked quarterly, 3) smoking history was not measured 4) reduced fraction of males in the IVAR group (IVAR=22%; placebo=31%). "ACP recommends not using intensive insulin therapy to strictly control blood glucose in non–surgical intensive care unit (SICU)/medical intensive care unit (MICU) patients with or without diabetes mellitus (Grade: strong recommendation, moderate-quality evidence)." "ACP recommends not using intensive insulin therapy to normalize blood glucose in SICU/MICU patients with or without diabetes mellitus (Grade: strong recommendation, high-quality evidence)." "ACP recommends a target blood glucose level of 7.8 to 11.1 mmol/L (140 to 200 mg/dL) if insulin therapy is used in SICU/MICU patients (Grade: weak recommendation, moderate-quality evidence)." This recommendation was updated without changes in 2013. For more information, see: Intensive care#Glucose control. Two clinical practice guidelines are available; however, both of these guidelines were developed without broad representation of stakeholders. This may lead to overly aggressive clinical recommendations. "Critically ill patients, between 80 to 110 mg/dL (grade A recommendation)"
"Critically ill patients: blood glucose levels should be kept as close to 110 mg/dl (6.1 mmol/l) as possible and generally <140 mg/dl (7.8 mmol/l). (A) These patients require an intravenous insulin protocol that has demonstrated efficacy and safety in achieving the desired glucose range without increasing risk for severe hypoglycemia. (E)"
Randomized controlled trials of tight glucose control in the critical care and perioperative care settings have produced mixed results. A meta-analysis of trials in the critical care setting concludes there is no benefit to tight control. Since the meta-analysis, two negative randomized controlled trials have been published. Two clinical practice guidelines are available; however, both of these guidelines were developed without broad representation of stakeholders. This may lead to overly aggressive clinical recommendations. A meta-analysis has addressed this issue. "Preprandial, less than 110 mg/dL (grade C recommendation)"
"Peak postprandial, less than 180 mg/dL (grade B recommendation)"
"Non–critically ill patients: there is no clear evidence for specific blood glucose goals. Since cohort data suggest that outcomes are better in hospitalized patients with fasting glucose <126 mg/dl and all random glucoses <180–200, these goals are reasonable if they can be safely achieved. Insulin is the preferred drug to treat hyperglycemia in most cases. (E)"
"Due to concerns regarding the risk of hypoglycemia, some institutions may consider these blood glucose levels to be overly aggressive for initial targets. Through quality improvement, glycemic goals should systematically be reduced to the recommended levels. (E)"
"Non-critically ill patients: premeal blood glucose levels should be kept as close to 90 to 130 mg/dL (5.0 to 7.2 mmol/L; midpoint of range 110 mg/dL) as possible given the clinical situation and postprandial blood glucose levels <180 mg/dL. Insulin should be used as necessary. (E)"
Regarding [[perioperative care|intraoperative control of glucose, a randomized controlled trial concluded "the increased incidence of death and stroke in the intensive treatment group raises concern about routine implementation of this intervention." Lower blood sugars may be beneficial in the intensive care of children. It is unclear if self-monitoring of blood glucose improves outcomes, especially among "reasonably well controlled non-insulin treated patients with type 2 diabetes." Self-monitoring may reduce quality of life. A low glycemic index diet may reduce the HbA1c. For more information, see: Sulfonylureas. Sulfonylureas are insulin secretagogues. They cause weight gain. Glyburide is excreted by both liver and kidneys. Meglitinides stimulate insulin release. Examples include nateglinide, repaglinide, and their analogs. These are associated with weight gain. Biguanides are insulin sensitizers and include metformin and phenformin. SGLT2 inhibitors (Gliflozin) inhibit renal sodium-glucose transport protein 2 (SGLT2)leading reduced reabsorption of glucose in the kidney. Examples include dapagliflozin, empagliflozin, canagliflozin. Thiazolidinediones (TZDs) are insulin sensitizers and include rosiglitazone, pioglitazone, and troglitazone. Rosiglitazone is safer than pioglitazone according to a systematic review published in 2011.
α-glucosidase inhibitors reduce carbohydrate absorption and include acarbose and miglitol. In general, these do not cause weight gain. Incretin therapy can reduce the glycosylated hemoglobin but may increase cancer and pancreatitis. Incretin mimetics. Incretin is an insulin secretagogue. Exenatide (Byetta®,Bydureon®) which can be given twice daily (Byetta®) or once weekly (Bydureon®). Liraglutide (Victoza®) may be more effective than the peptide analog sitagliptin because GLP-1 receptor agonists do not rely on endogenous incretin secretion that DPP-4 inhibitors require. For more information, see: insulin. If dietary changes are not successful, medication is needed. Metformin is usually the first drug according to clinical practice guidelines. Metformin and second-generation sulfonylureas and are excellent choices according to a systematic review of randomized controlled trials. Confirming the role of metformin, the initial choice of anti-diabetic drug has been compared in a randomized controlled trial which found "cumulative incidence of monotherapy failure at 5 years of 15% with rosiglitazone, 21% with metformin, and 34% with glyburide." While thiazolidinediones such as rosiglitazone are effective, they may increase drug toxicity such as heart failure and fractures. For patients with heart failure, metformin may be the best choice. If antidiabetic drugs fail, insulin therapy may be necessary. The initial insulin regimen can be chosen based on the patient's blood glucose profile. When insulin is started, "insulin secretagogues (sulfonylurea or glinides) should be discontinued, or tapered and then discontinued, since they are not considered to be synergistic." Initially, adding bedtime insulin to patients failing oral medications is more effective and with less weight gain than using multiple dose insulin. Nightly insulin combines better with metformin that with sulfonylureas. The initial dose of nightly insulin (measured in IU/d) should be equal to the fasting blood glucose level (measured in mmol/L). If the fasting glucose is reported in mg/dl, multiple by 0.05551 (or divided by 18) to convert to mmol/L. When nightly insulin is insufficient, multiple doses are required. Long acting insulins such as insulin glargine and insulin detemir (shorter half-life). A meta-analysis of randomized controlled trials by the Cochrane Collaboration found "only a minor clinical benefit of treatment with long-acting insulin analogues for patients with diabetes mellitus type 2." More recent randomized controlled trials have found no differences with glargine. The 4T study reported at 1 year and have found that although long acting insulins were less effective, they were associated with less hypoglycemia. After three years, improved control occurred with the newer insulins with less hypoglycemia. Treating to a goal of LDL-C < 70 mg/dl and systolic blood pressure to < 115 mm Hg may cause regression of carotid initial media thickness in a randomized controlled trial. Aspirin may not be justified just because a patients had diabetes. After treatment with ramipril for 5 years the number needed to treat was 50 patients to prevent one cardiovascular death. Initially, other angiotensin-converting enzyme inhibitors were thought to be not be as effective. However, subsequent studies have shown the apparent benefit of ramipril independent of blood pressure reduction was more likely due to the administration of ramipril at night and recording blood pressures during the day when the least effect of ramipril was present. According to clinical practice guidelines, when treating hypertension in the diabetic patients, the goal blood pressure is 130/80 which is lower than in non-diabetic patients. However, a subsequent randomized controlled trial found no benefit in treating to a level of 120 mm Hg. "In subjects with type 2 diabetes and hypertension but with normoalbuminuria, the use of trandolapril plus verapamil and trandolapril alone decreased the incidence of microalbuminuria to a similar extent. The effect of verapamil alone was similar to that of placebo," according to the BENEDICT randomized controlled trial. Recommendation 1: Lipid-lowering therapy should be used for secondary prevention of cardiovascular mortality and morbidity for all patients (both men and women) with known coronary artery disease and type 2 diabetes. Recommendation 2: Statins should be used for primary prevention against macrovascular complications in patients (both men and women) with type 2 diabetes and other cardiovascular risk factors. Recommendation 3: Once lipid-lowering therapy is initiated, patients with type 2 diabetes mellitus should be taking at least moderate doses of a statin (the accompanying evidence report states "simvastatin, 40 mg/d; pravastatin, 40 mg/d; lovastatin, 40 mg/d; atorvastatin, 20 mg/d; or an equivalent dose of another statin"). Recommendation 4: For those patients with type 2 diabetes who are taking statins, routine monitoring of liver function tests or muscle enzymes is not recommended except in specific circumstances. Statin therapy prevents major vascular events in about 1 of every 24 patients with [diabetes who use the treatment for 5 years if they are similar to the patients in the meta-analysis by Kearney et al (Number needed to treat is 24). Whether diabetes is an equivalent risk factor to having an existing myocardial infarction is debated. Bariatric surgery remits diabetes mellitus type 2 in more than 1 of every two people after 2 years if they are similar to the patients in the randomized controlled trial / meta-analysis by Dixon et al (Number needed to treat is 1.74). In this trial 73% of the patients who remitted their diabetes versus 13% of the patients in the control group. For more information, see: Hypoglycemia. Hypoglycemia from intensive therapy is associated with cardiovascular adverse outcomes. For more information, see: Hyperglycemic hyperosmolar nonketotic coma. For more information, see: Diabetic ketoacidosis. ↑ Anonymous (2016), Diabetes Mellitus, Type 2 (English). Medical Subject Headings. U.S. National Library of Medicine. ↑ National Center for Chronic Disease Prevention and Health Promotion. (2008) What is Diabetes? ↑ American Diabetes Association (2011). "Standards of medical care in diabetes--2011.". Diabetes Care 34 Suppl 1: S11-61. DOI:10.2337/dc11-S011. PMID 21193625. PMC PMC3006050. Research Blogging. ↑ National Diabetes Information Clearinghouse. The National Institute of Diabetes and Digestive and Kidney Diseases (NIDDK). 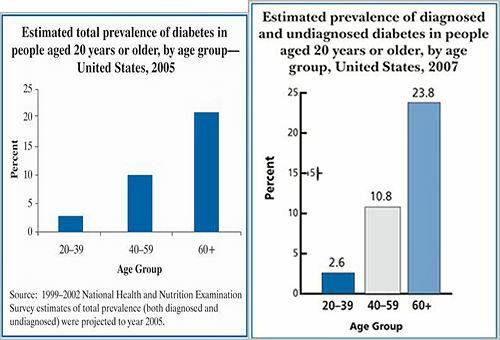 (2007) National Diabetes Statistics, 2007. ↑ Glaser B (January 2003). "Dominant SUR1 mutation causing autosomal dominant type 2 diabetes". Lancet 361 (9354): 272–3. DOI:10.1016/S0140-6736(03)12363-X. PMID 12559857. Research Blogging. ↑ 10.0 10.1 10.2 .World Health Organization. Definition, diagnosis and classification of diabetes mellitus and its complications: Report of a WHO Consultation. Part 1. Diagnosis and classification of diabetes mellitus. Retrieved on 2007-05-29. ↑ Manley SE, Sikaris KA, Lu ZX, et al (February 2009). "Validation of an algorithm combining haemoglobin A(1c) and fasting plasma glucose for diagnosis of diabetes mellitus in UK and Australian populations". Diabet. Med. 26 (2): 115–21. DOI:10.1111/j.1464-5491.2008.02652.x. PMID 19236612. Research Blogging. ↑ (June 2009) "International Expert Committee Report on the Role of the A1C Assay in the Diagnosis of Diabetes". Diabetes Care. DOI:10.2337/dc09-9033. PMID 19502545. Research Blogging. ↑ Carson AP, Reynolds K, Fonseca VA, Muntner P (2010). "Comparison of A1C and fasting glucose criteria to diagnose diabetes among U.S. adults.". Diabetes Care 33 (1): 95-7. DOI:10.2337/dc09-1227. PMID 19808920. PMC PMC2797994. Research Blogging. ↑ Norris, Susan L.; Devan Kansagara, Christina Bougatsos, Rongwei Fu (2008-06-03). "Screening Adults for Type 2 Diabetes: A Review of the Evidence for the U.S. Preventive Services Task Force". Ann Intern Med 148 (11): 855-868. PMID 18519931. Retrieved on 2008-06-03. ↑ Hoerger TJ, Hicks KA, Sorensen SW, et al (2007). "Cost-effectiveness of screening for pre-diabetes among overweight and obese U.S. adults". Diabetes Care 30 (11): 2874–9. DOI:10.2337/dc07-0885. PMID 17698614. Research Blogging. ↑ 22.0 22.1 Harris R, Donahue K, Rathore SS, Frame P, Woolf SH, Lohr KN (2003). "Screening adults for type 2 diabetes: a review of the evidence for the U.S. Preventive Services Task Force". Ann. Intern. Med. 138 (3): 215-29. PMID 12558362. ↑ 10-year CVD Risk Calculator (Risk Assessment Tool for Estimating 10-year Risk of Developing Hard CHD (Myocardial Infarction and Coronary Death) Version). Retrieved on 2007-11-14. ↑ Care, Canadian Task Force on Preventive Health (2012-10-16). "Recommendations on screening for type 2 diabetes in adults". Canadian Medical Association Journal 184 (15): 1687-1696. DOI:10.1503/cmaj.120732. ISSN 1488-2329 0820-3946, 1488-2329. Retrieved on 2012-10-17. Research Blogging. ↑ 29.0 29.1 Heikes KE, Eddy DM, Arondekar B, Schlessinger L (May 2008). "Diabetes Risk Calculator: a simple tool for detecting undiagnosed diabetes and pre-diabetes". Diabetes Care 31 (5): 1040–5. DOI:10.2337/dc07-1150. PMID 18070993. Research Blogging. ↑ 30.0 30.1 Collins GS, Altman DG (2011). "External validation of QDSCORE(®) for predicting the 10-year risk of developing Type 2 diabetes.". Diabet Med 28 (5): 599-607. DOI:10.1111/j.1464-5491.2011.03237.x. PMID 21480970. Research Blogging. ↑ 31.0 31.1 Ziemer DC, Kolm P, Foster JK, et al (2008). "Random Plasma Glucose in Serendipitous Screening for Glucose Intolerance: Screening for Impaired Glucose Tolerance Study 2". J Gen Intern Med. DOI:10.1007/s11606-008-0524-1. PMID 18335280. Research Blogging. ↑ Choi SH, Kim TH, Lim S, Park KS, Jang HC, Cho NH (2011). "Hemoglobin A1c as a Diagnostic Tool for Diabetes Screening and New-Onset Diabetes Prediction: A 6-year community-based prospective study.". Diabetes Care 34 (4): 944-9. DOI:10.2337/dc10-0644. PMID 21335372. PMC PMC3064055. Research Blogging. ↑ Pradhan AD, Rifai N, Buring JE, Ridker PM (2007). "Hemoglobin A1c predicts diabetes but not cardiovascular disease in nondiabetic women". Am. J. Med. 120 (8): 720-7. DOI:10.1016/j.amjmed.2007.03.022. PMID 17679132. Research Blogging. ↑ Olson DE, Rhee MK, Herrick K, Ziemer DC, Twombly JG, Phillips LS (2010). "Screening for diabetes and pre-diabetes with proposed A1C-based diagnostic criteria.". Diabetes Care 33 (10): 2184-9. DOI:10.2337/dc10-0433. PMID 20639452. PMC PMC2945158. Research Blogging. ↑ 36.0 36.1 Griffin SJ, Borch-Johnsen K, Davies MJ, Khunti K, Rutten GE, Sandbæk A et al. (2011). "Effect of early intensive multifactorial therapy on 5-year cardiovascular outcomes in individuals with type 2 diabetes detected by screening (ADDITION-Europe): a cluster-randomised trial.". Lancet 378 (9786): 156-67. DOI:10.1016/S0140-6736(11)60698-3. PMID 21705063. Research Blogging. ↑ 37.0 37.1 The NAVIGATOR Study Group (2010). "Effect of Valsartan on the Incidence of Diabetes and Cardiovascular Events.". N Engl J Med. DOI:10.1056/NEJMoa1001121. PMID 20228403. Research Blogging. ↑ 38.0 38.1 The NAVIGATOR Study Group (2010). "Effect of Nateglinide on the Incidence of Diabetes and Cardiovascular Events.". N Engl J Med. DOI:10.1056/NEJMoa1001122. PMID 20228402. Research Blogging. ↑ 42.0 42.1 42.2 Ratner R, Goldberg R, Haffner S, Marcovina S, Orchard T, Fowler S et al. (2005). "Impact of intensive lifestyle and metformin therapy on cardiovascular disease risk factors in the diabetes prevention program.". Diabetes Care 28 (4): 888-94. PMID 15793191. PMC PMC1307521. ↑ 44.0 44.1 44.2 Gerstein HC, Yusuf S, Bosch J, et al (2006). "Effect of rosiglitazone on the frequency of diabetes in patients with impaired glucose tolerance or impaired fasting glucose: a randomised controlled trial". Lancet 368 (9541): 1096–105. DOI:10.1016/S0140-6736(06)69420-8. PMID 16997664. Research Blogging. ↑ 45.0 45.1 Salpeter SR, Buckley NS, Kahn JA, Salpeter EE (2008). "Meta-analysis: metformin treatment in persons at risk for diabetes mellitus". Am. J. Med. 121 (2): 149–157.e2. DOI:10.1016/j.amjmed.2007.09.016. PMID 18261504. Research Blogging. ↑ 46.0 46.1 Kawamori R, Tajima N, Iwamoto Y, Kashiwagi A, Shimamoto K, Kaku K (May 2009). "Voglibose for prevention of type 2 diabetes mellitus: a randomised, double-blind trial in Japanese individuals with impaired glucose tolerance". Lancet 373 (9675): 1607–14. DOI:10.1016/S0140-6736(09)60222-1. PMID 19395079. Research Blogging. ↑ Gerstein HC, Yusuf S, Holman R, Bosch J, Pogue J (2004). "Rationale, design and recruitment characteristics of a large, simple international trial of diabetes prevention: the DREAM trial". Diabetologia 47 (9): 1519–27. DOI:10.1007/s00125-004-1485-5. PMID 15322749. Research Blogging. ↑ Eriksson KF, Lindgärde F (December 1991). "Prevention of type 2 (non-insulin-dependent) diabetes mellitus by diet and physical exercise. The 6-year Malmö feasibility study". Diabetologia 34 (12): 891–8. DOI:10.1007/BF00400196. PMID 1778354. Research Blogging. ↑ Park S, Choi SB (2003). "Induction of long-term normoglycemia without medication in Korean type 2 diabetes patients after continuous subcutaneous insulin infusion therapy". Diabetes Metab. Res. Rev. 19 (2): 124–30. DOI:10.1002/dmrr.343. PMID 12673780. Research Blogging. ↑ Retnakaran R, Drucker DJ (May 2008). "Intensive insulin therapy in newly diagnosed type 2 diabetes". Lancet 371 (9626): 1725–6. DOI:10.1016/S0140-6736(08)60736-9. PMID 18502278. Research Blogging. ↑ Boussageon R, Bejan-Angoulvant T, Saadatian-Elahi M, Lafont S, Bergeonneau C, Kassaï B et al. (2011). 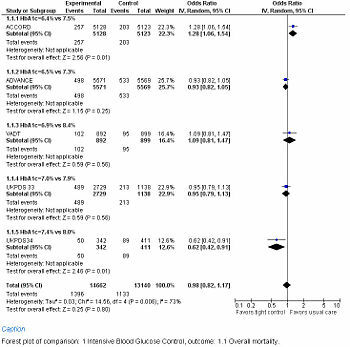 "Effect of intensive glucose lowering treatment on all cause mortality, cardiovascular death, and microvascular events in type 2 diabetes: meta-analysis of randomised controlled trials.". BMJ 343: d4169. DOI:10.1136/bmj.d4169. PMID 21791495. Research Blogging. ↑ Huang ES, Zhang Q, Gandra N, Chin MH, Meltzer DO (2008). "The effect of comorbid illness and functional status on the expected benefits of intensive glucose control in older patients with type 2 diabetes: a decision analysis.". Ann Intern Med 149 (1): 11-9. PMID 18591633. PMC PMC2562733. ↑ Yau CK, Eng C, Cenzer IS, John Boscardin W, Rice-Trumble K, Lee SJ (2012). "Glycosylated hemoglobin and functional decline in community-dwelling nursing home-eligible elderly adults with diabetes mellitus.". J Am Geriatr Soc 60 (7): 1215-21. DOI:10.1111/j.1532-5415.2012.04041.x. PMID 22702660. Research Blogging. ↑ 59.0 59.1 59.2 Nathan DM, Buse JB, Davidson MB, et al (January 2009). "Medical management of hyperglycemia in type 2 diabetes: a consensus algorithm for the initiation and adjustment of therapy: a consensus statement of the American Diabetes Association and the European Association for the Study of Diabetes". Diabetes Care 32 (1): 193–203. DOI:10.2337/dc08-9025. PMID 18945920. Research Blogging. ↑ Woo V (March 2009). "Medical management of hyperglycemia in type 2 diabetes: a consensus algorithm for the initiation and adjustment of therapy: a consensus statement of the American Diabetes Association and the European Association for the Study of Diabetes: response to Nathan et al". Diabetes Care 32 (3): e34; author reply e37–8. DOI:10.2337/dc08-2093. PMID 19246585. Research Blogging. ↑ Home P, Mant J, Diaz J, Turner C (June 2008). "Management of type 2 diabetes: summary of updated NICE guidance". BMJ 336 (7656): 1306–8. DOI:10.1136/bmj.39560.442095.AD. PMID 18535074. PMC 2413390. Research Blogging. ↑ NICE guidance by type. Retrieved on 2008-08-26. ↑ Anonymous. NICE guidelines for diabetes mellitus, type 2. Daily POEMS. Essential Evidence Plus. Retrieved on 2008-08-26. ↑ Brown AF, Mangione CM, Saliba D, Sarkisian CA (2003). "Guidelines for improving the care of the older person with diabetes mellitus". Journal of the American Geriatrics Society 51 (5 Suppl Guidelines): S265–80. DOI:10.1046/j.1532-5415.51.5s.1.x. PMID 12694461. Research Blogging. ↑ (1998) "Effect of intensive blood-glucose control with metformin on complications in overweight patients with type 2 diabetes (UKPDS 34). UK Prospective Diabetes Study (UKPDS) Group.". Lancet 352 (9131): 854-65. PMID 9742977. ↑ Duckworth W, Abraira C, Moritz T, et al (January 2009). "Glucose control and vascular complications in veterans with type 2 diabetes". N. Engl. J. Med. 360 (2): 129–39. DOI:10.1056/NEJMoa0808431. PMID 19092145. Research Blogging. ↑ (June 2008) "Intensive Blood Glucose Control and Vascular Outcomes in Patients with Type 2 Diabetes". N. Engl. J. Med. 358 (24): 2560–2572. DOI:10.1056/NEJMoa0802987. PMID 18539916. Research Blogging. ↑ Anonymous (February 6, 2008). For Safety, NHLBI Changes Intensive Blood Sugar Treatment Strategy in Clinical Trial of Diabetes and Cardiovascular Disease -. National Institutes of Health (NIH). Retrieved on 2008-02-07. ↑ Gerstein HC, Miller ME, Byington RP, et al (June 2008). "Effects of intensive glucose lowering in type 2 diabetes". N. Engl. J. Med. 358 (24): 2545–59. DOI:10.1056/NEJMoa0802743. PMID 18539917. Research Blogging. ↑ The ORIGIN Trial Investigators (2012). "Basal Insulin and Cardiovascular and Other Outcomes in Dysglycemia.". N Engl J Med. DOI:10.1056/NEJMoa1203858. PMID 22686416. Research Blogging. ↑ 79.0 79.1 Kilo C, Miller JP, Williamson JR (1980). "The Achilles heel of the University Group Diabetes Program.". JAMA 243 (5): 450-7. DOI:10.1001/jama.1980.03300310038020. PMID 6985989. Research Blogging. ↑ 80.0 80.1 80.2 Genuth S (1996). "Exogenous insulin administration and cardiovascular risk in non-insulin-dependent and insulin-dependent diabetes mellitus.". Ann Intern Med 124 (1 Pt 2): 104-9. PMID 8554200. ↑ Gaster B, Hirsch IB (1998). "The effects of improved glycemic control on complications in type 2 diabetes.". Arch Intern Med 158 (2): 134-40. PMID 9448551. ↑ Umpierrez GE, Hellman R, Korytkowski MT, Kosiborod M, Maynard GA, Montori VM et al. (2012). "Management of hyperglycemia in hospitalized patients in non-critical care setting: an endocrine society clinical practice guideline.". J Clin Endocrinol Metab 97 (1): 16-38. DOI:10.1210/jc.2011-2098. PMID 22223765. Research Blogging. ↑ Qaseem, Amir; Linda L. Humphrey, Roger Chou, Vincenza Snow, Paul Shekelle, for the Clinical Guidelines Committee of the American College of Physicians (2011-02-15). "Use of Intensive Insulin Therapy for the Management of Glycemic Control in Hospitalized Patients: A Clinical Practice Guideline From the American College of Physicians". Annals of Internal Medicine 154 (4): 260 -267. DOI:10.1059/0003-4819-154-4-201102150-00007. Retrieved on 2011-02-15. Research Blogging. ↑ Qaseem A, Chou R, Humphrey LL, Shekelle P, for the Clinical Guidelines Committee of the American College of Physicians (2013). "Inpatient Glycemic Control: Best Practice Advice From the Clinical Guidelines Committee of the American College of Physicians.". Am J Med Qual. DOI:10.1177/1062860613489339. PMID 23709472. Research Blogging. ↑ Soylemez Wiener R, Wiener DC, Larson RJ (August 2008). "Benefits and risks of tight glucose control in critically ill adults: a meta-analysis". JAMA 300 (8): 933–44. DOI:10.1001/jama.300.8.933. PMID 18728267. Research Blogging. ↑ The NICE-SUGAR Study Investigators (2009-03-24). "Intensive versus Conventional Glucose Control in Critically Ill Patients". N Engl J Med: NEJMoa0810625. DOI:10.1056/NEJMoa0810625. Retrieved on 2009-03-24. Research Blogging. ↑ Arabi YM, Dabbagh OC, Tamim HM, et al (December 2008). "Intensive versus conventional insulin therapy: a randomized controlled trial in medical and surgical critically ill patients". Crit. Care Med. 36 (12): 3190–7. DOI:10.1097/CCM.0b013e31818f21aa. PMID 18936702. Research Blogging. ↑ Farmer A, Wade A, Goyder E, et al (2007). "Impact of self monitoring of blood glucose in the management of patients with non-insulin treated diabetes: open parallel group randomised trial". DOI:10.1136/bmj.39247.447431.BE. PMID 17591623. Research Blogging. ↑ Jenkins, David J. A.; Cyril W. C. Kendall, Gail McKeown-Eyssen, Robert G. Josse, Jay Silverberg, Gillian L. Booth, Edward Vidgen, Andrea R. Josse, Tri H. Nguyen, Sorcha Corrigan, Monica S. Banach, Sophie Ares, Sandy Mitchell, Azadeh Emam, Livia S. A. Augustin, Tina L. Parker, Lawrence A. Leiter (2008-12-17). "Effect of a Low-Glycemic Index or a High-Cereal Fiber Diet on Type 2 Diabetes: A Randomized Trial". JAMA 300 (23): 2742-2753. DOI:10.1001/jama.2008.808. Retrieved on 2008-12-17. Research Blogging. ↑ 98.0 98.1 Phung OJ, Scholle JM, Talwar M, Coleman CI (2010). "Effect of noninsulin antidiabetic drugs added to metformin therapy on glycemic control, weight gain, and hypoglycemia in type 2 diabetes.". JAMA 303 (14): 1410-8. DOI:10.1001/jama.2010.405. PMID 20388897. Research Blogging. ↑ Loke, Y. K.; C. S. Kwok, S. Singh (2011). "Comparative cardiovascular effects of thiazolidinediones: systematic review and meta-analysis of observational studies". BMJ 342 (mar17 1): d1309-d1309. DOI:10.1136/bmj.d1309. ISSN 0959-8138. Retrieved on 2011-03-24. Research Blogging. ↑ 101.0 101.1 Parks M, Rosebraugh C (2010). "Weighing risks and benefits of liraglutide--the FDA's review of a new antidiabetic therapy.". N Engl J Med 362 (9): 774-7. DOI:10.1056/NEJMp1001578. PMID 20164475. Research Blogging. ↑ Masur K, Schwartz F, Entschladen F, Niggemann B, Zaenker KS (2006). "DPPIV inhibitors extend GLP-2 mediated tumour promoting effects on intestinal cancer cells.". Regul Pept 137 (3): 147-55. DOI:10.1016/j.regpep.2006.07.003. PMID 16908079. Research Blogging. ↑ Diamant M, Van Gaal L, Stranks S, Northrup J, Cao D, Taylor K et al. (2010). "Once weekly exenatide compared with insulin glargine titrated to target in patients with type 2 diabetes (DURATION-3): an open-label randomised trial.". Lancet 375 (9733): 2234-43. DOI:10.1016/S0140-6736(10)60406-0. PMID 20609969. Research Blogging. ↑ Pratley RE, Nauck M, Bailey T, Montanya E, Cuddihy R, Filetti S et al. (2010). "Liraglutide versus sitagliptin for patients with type 2 diabetes who did not have adequate glycaemic control with metformin: a 26-week, randomised, parallel-group, open-label trial.". Lancet 375 (9724): 1447-56. DOI:10.1016/S0140-6736(10)60307-8. PMID 20417856. Research Blogging. ↑ Richter B, Bandeira-Echtler E, Bergerhoff K, Lerch CL (2008). "Dipeptidyl peptidase-4 (DPP-4) inhibitors for type 2 diabetes mellitus.". Cochrane Database Syst Rev (2): CD006739. DOI:10.1002/14651858.CD006739.pub2. PMID 18425967. Research Blogging. ↑ Nauck MA, Ellis GC, Fleck PR, Wilson CA, Mekki Q, Alogliptin Study 008 Group (2009). "Efficacy and safety of adding the dipeptidyl peptidase-4 inhibitor alogliptin to metformin therapy in patients with type 2 diabetes inadequately controlled with metformin monotherapy: a multicentre, randomised, double-blind, placebo-controlled study.". Int J Clin Pract 63 (1): 46-55. DOI:10.1111/j.1742-1241.2008.01933.x. PMID 19125992. Research Blogging. ↑ Kahn SE, Haffner SM, Heise MA, et al (2006). "Glycemic durability of rosiglitazone, metformin, or glyburide monotherapy". N. Engl. J. Med. 355 (23): 2427-43. DOI:10.1056/NEJMoa066224. PMID 17145742. Research Blogging. ↑ Eurich DT, McAlister FA, Blackburn DF, et al (2007). "Benefits and harms of antidiabetic agents in patients with diabetes and heart failure: systematic review". BMJ 335 (7618): 497. DOI:10.1136/bmj.39314.620174.80. PMID 17761999. Research Blogging. ↑ 115.0 115.1 Holman RR, Thorne KI, Farmer AJ, et al (2007). "Addition of Biphasic, Prandial, or Basal Insulin to Oral Therapy in Type 2 Diabetes". N. Engl. J. Med. 357. DOI:10.1056/NEJMoa075392. PMID 17890232. Research Blogging. ↑ Malone JK, Kerr LF, Campaigne BN, Sachson RA, Holcombe JH (2004). "Combined therapy with insulin lispro Mix 75/25 plus metformin or insulin glargine plus metformin: a 16-week, randomized, open-label, crossover study in patients with type 2 diabetes beginning insulin therapy". Clinical therapeutics 26 (12): 2034-44. DOI:10.1016/j.clinthera.2004.12.015. PMID 15823767. Research Blogging. ↑ Horvath K, Jeitler K, Berghold A, Ebrahim Sh, Gratzer T, Plank J, Kaiser T, Pieber T, Siebenhofer A (2007). "Long-acting insulin analogues versus NPH insulin (human isophane insulin) for type 2 diabetes mellitus". Cochrane database of systematic reviews (Online) (2): CD005613. PMID 17443605. ↑ Holman RR, Farmer AJ, Davies MJ, Levy JC, Darbyshire JL, Keenan JF et al. (2009). "Three-year efficacy of complex insulin regimens in type 2 diabetes.". N Engl J Med 361 (18): 1736-47. DOI:10.1056/NEJMoa0905479. PMID 19850703. Research Blogging. ↑ Howard, B. V., Roman, M. J., Devereux, R. B., Fleg, J. L., Galloway, J. M., Henderson, J. A., et al. (2008). Effect of Lower Targets for Blood Pressure and LDL Cholesterol on Atherosclerosis in Diabetes: The SANDS Randomized Trial. JAMA, 299(14), 1678-1689. DOI:10.1001/jama.299.14.1678. ↑ Ogawa H, Nakayama M, Morimoto T, Uemura S, Kanauchi M, Doi N et al. (2008). "Low-dose aspirin for primary prevention of atherosclerotic events in patients with type 2 diabetes: a randomized controlled trial.". JAMA 300 (18): 2134-41. DOI:10.1001/jama.2008.623. PMID 18997198. Research Blogging. ↑ Svensson P, de Faire U, Sleight P, Yusuf S, Ostergren J (2001). "Comparative effects of ramipril on ambulatory and office blood pressures: a HOPE Substudy.". Hypertension 38 (6): E28-32. PMID 11751742. ↑ Kurtz TW (2003). "False claims of blood pressure-independent protection by blockade of the renin angiotensin aldosterone system?". Hypertension 41 (2): 193-6. PMID 12574079. ↑ 127.0 127.1 127.2 The ACCORD Study Group (2010). "Effects of Intensive Blood-Pressure Control in Type 2 Diabetes Mellitus.". N Engl J Med. DOI:10.1056/NEJMoa1001286. PMID 20228401. Research Blogging. ↑ Chobanian AV, Bakris GL, Black HR, et al (2003). "The Seventh Report of the Joint National Committee on Prevention, Detection, Evaluation, and Treatment of High Blood Pressure: the JNC 7 report". JAMA 289 (19): 2560-72. DOI:10.1001/jama.289.19.2560. PMID 12748199. Research Blogging. ↑ Snow V, Aronson M, Hornbake E, Mottur-Pilson C, Weiss K (2004). "Lipid control in the management of type 2 diabetes mellitus: a clinical practice guideline from the American College of Physicians". Ann Intern Med 140 (8): 644-9. PMID 15096336. ↑ Kearney PM, Blackwell L, Collins R, et al (2008). "Efficacy of cholesterol-lowering therapy in 18,686 people with diabetes in 14 randomised trials of statins: a meta-analysis". Lancet 371 (9607): 117–25. DOI:10.1016/S0140-6736(08)60104-X. PMID 18191683. Research Blogging. ↑ Bulugahapitiya U, Siyambalapitiya S, Sithole J, Idris I (February 2009). "Is diabetes a coronary risk equivalent? Systematic review and meta-analysis". Diabet. Med. 26 (2): 142–8. DOI:10.1111/j.1464-5491.2008.02640.x. PMID 19236616. Research Blogging. ↑ John B. Dixon et al., “Adjustable Gastric Banding and Conventional Therapy for Type 2 Diabetes: A Randomized Controlled Trial,” JAMA 299, no. 3 (January 23, 2008). ↑ Zoungas S, Patel A, Chalmers J, de Galan BE, Li Q, Billot L et al. (2010). "Severe hypoglycemia and risks of vascular events and death.". N Engl J Med 363 (15): 1410-8. DOI:10.1056/NEJMoa1003795. PMID 20925543. Research Blogging. This page was last modified 15:17, 18 July 2016.